The Need For Balance - Dealing with the Causes of Meniere's is finally available. 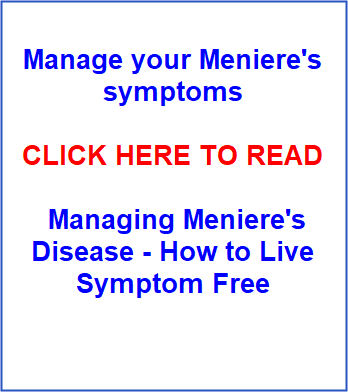 This self help guide delves deep into the root causes of Menieres and helps you understand how and why each cause can manifest Meniere's symptoms. In each case you will learn what you can do to eliminate it from your life and regain your health completely. Everything is supported by medical and scientific studies, data and statistics but most importantly, the real experiences of sufferers. Copies are immediately downloadable for you to get started on the road to recovery today. Everybody can identify their root cause(s) and take appropriate action in their individual case. Click here to learn more and read what early recipients of this resource are saying. ***** "Thank you for all of your years of research and sharing with others. Amazing! With all due respect even Johns Hopkins doesn't offer what you are offering in your book. I would love for every patient to read your books to help them." This site has been dedicated to bringing you comprehensive information and breaking through the mis-perceptions and mis-information regarding this condition since 2004. For sufferers to overcome Meniere's disease, we need to change attitudes, outdated practices and the all too common passively accepted belief that there is no known cause and no known cure. The fact is, there is no known definitive cause and therefore no known definitive cure. There are good reasons for this and it seems that will never change. However, there is a cause for everything. Cause and effect is an undeniable fact of human biology. The root cause in one individual can be very different in another. The end results are the same, the effects within the body are mostly the same but the root causes can vary from person to person. The good news is, after years of searching for needles in haystacks, the causes are indeed known. Identify your root cause, take the appropriate action needed in your individual case, eliminate that cause and you have found your cure. The even better news is, you have landed in the right place to learn how to do this. You can learn how to manage your condition to make life bearable again and function normally and you can learn how to identify your own particular root cause(s) and correct or eliminate them. Read through the website and blog and/or read Mike Spencer's self help books: Managing Meniere's Disease - How to Live Symptom Free and The Need for Balance - Dealing with the Causes of Meniere's. Take your time. Screen time can spark vertigo attacks and dizziness. So it would be advisable to read one or two pages or articles on the blog at a time then take a rest. Better still, download the books and read at your leisure. The main focus of this site has always been to give you positive evidence based information and support in controlling and ridding yourself of your symptoms. With over 13 years of experience supporting Meniere's sufferers and over 8 years of extensive research and study into triggers and underlying causes, we can now categorically say that nobody has to live with this debilitating condition. Never let anyone tell you that there is nothing more that can be done, learn to live with it or it is in your head. Your symptoms are very real and there are very real underlying causes and reasons you are experiencing such horrendous symptoms. 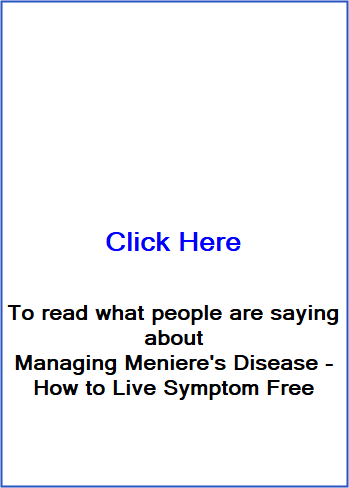 Meniere's is not a 'disease' as such. It is an idiopathic set of symptoms that get lumped together under this label. When you are diagnosed with Meniere's, all that means in reality is you have a set of symptoms, three of which are usually considered by mainstream medicine to include the classic triad of fluctuating hearing loss, dizziness and tinnitus. After what are usually a rather shallow reaching set of tests to rule out more sinister things such as a tumor and confirm things like hearing loss it is then declared to be "Meniere's", which is basically saying you have a set of symptoms and we don't know why. What they are effectively doing is consigning you to the 'can't be solved' file. "Take your drugs and learn to live with it" should simply be unacceptable to you. The problem is cultural. In modern medical practice, doctors are, on the whole, trained to 'treat symptoms' rather than investigate the underlying cause and eliminate it. This problem is endemic in today's attitude to medicine. Are you gong to passively accept the dogma that you can only treat your symptoms with drugs and accept you have to live with it? Or are you going to get proactive and learn what you need to do to overcome this condition completely? And make no mistake you can overcome Meniere's. To think anything else is an outdated opinion based on lack of knowledge. This can be done, it has been done and is being done all the time. The bottom line is, you DO NOT have to live with Meniere's. Understand this, get informed and take appropriate action in your individual case. You CAN become healthy again. Regularly updated information, news, success stories, research, clinical trials, studies, discussions and readers comments. Is it possible to regain your hearing? Can SPC-Flakes stop vertigo? Can SPC-Flakes stop vertigo in the Meniere's sufferer? Meniere's Low Salt Diet Why is sodium so important and how to manage it.